I’ve listened to some particularly interesting podcast episodes in the last few days, so I thought I’d share pointers to them. At the top of the list, Conversations at the Washington Library featured Joe Stoltz speaking with Brenda Parker, a character interpreter at Mount Vernon. 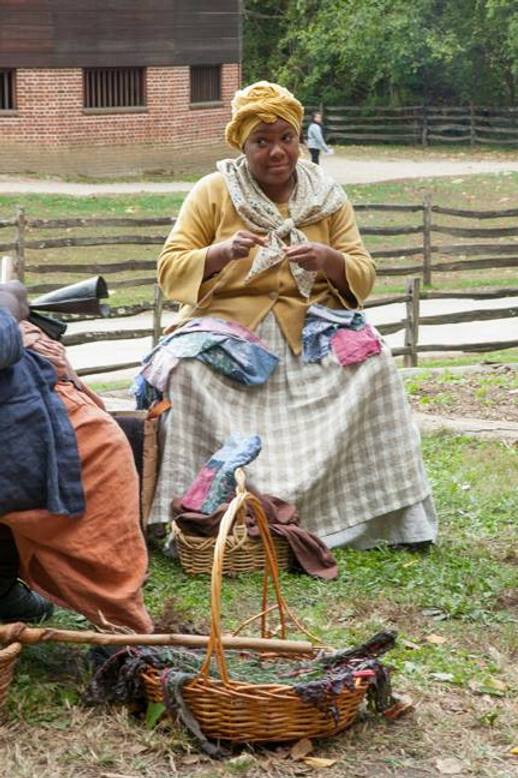 As an African-American woman, Parker portrays the roles of several workers enslaved to George and Martha Washington. Those women are documented through their work and families but their own voices were never recorded. This interview reveals how Parker came to that job and the sensitivities she needs to do it well. Parker explains that, even with her theatrical training and experience, she started work at Mount Vernon as a waitress in the restaurant. She and her husband had kids to feed and send to college, and food service provided a steadier income than character interpretation, at least at the starting level. At New Books Network, Rebekah Buchanan interviewed M. J. Rymsza-Pawlowska, author of History Comes Alive: Public History and Popular Culture in the 1970s. Their conversation isn’t about Revolutionary history but about how the nation remembered that Revolutionary history in a particular time. I have vivid memories of the Bicentennial, and I’m now involved in Revolution 250’s activities for the Sestercentennial, so I was drawn into the backstage nuances of this topic. Wish there were more about fire hydrants, though. I haven’t listened to the Age of Jackson podcast before because that’s not Revolutionary America. (I might even argue that’s when the American Founding was decisively over and a new reshaping began.) But my ear was caught by Daniel Gullotta talking to Gregory D. Smithers about his book The Cherokee Diaspora: An Indigenous History of Migration, Resettlement, and Identity. The story begins when the the Cherokee were an Iroquoian-speaking people in the midst of suspicious tribes from other cultures, then extends well beyond the “Trail of Tears,” as the Cherokee nations are one of the largest Native American ethnic groupings today. Also interesting is that both Smithers and Gullotta are Australian—they even share an alma mater. Finally, on Ben Franklin’s World, Liz Covart spoke to Garrett Cloer, Supervisory Park Ranger at the Longfellow House–Washington’s Headquarters National Historic Site. Liz was once an National Park Service ranger while Garrett has been with the agency for nine years, including service at Minute Man and Independence parks before he came to Cambridge. They could thus talk about the place of smaller urban parks in the N.P.S. I knew most of the history here already, but Garrett did a masterful job of summing it up and making the case for a visit this summer.